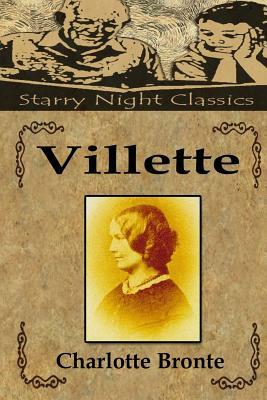 Villette is an 1853 novel written by English author Charlotte Bront . After an unspecified family disaster, the protagonist Lucy Snowe travels from her native England to the fictional French-speaking city of Villette to teach at a girls' school, where she is drawn into adventure and romance. Villette was Charlotte Bront 's third and last novel; it was preceded by The Professor (her posthumously published first novel, of which Villette is a reworking), Jane Eyre, and Shirley. In 1842 Charlotte Bront , at the age of 26, travelled to Brussels, Belgium, with her sister Emily. There they enrolled in a pensionnat (boarding school) run by M. and Mme. Constantin H ger. In return for board and tuition, Charlotte taught English and Emily taught music. The sisters' time at the pensionnat was cut short when their aunt, Elizabeth Branwell, died in October 1842. Elizabeth had joined the Bront family to care for their children after the death of Maria Bront , n e Maria Branwell, the mother of the Bront sisters. Charlotte returned, alone, to Brussels in January 1843 to take up a teaching post at the pensionnat. Her second stay in Brussels was not a happy one. She became lonely and homesick, and fell in love with M. H ger, a married man. She finally returned to her family's rectory in Haworth, England, in January 1844. Charlotte drew on this source material for her first (albeit unsuccessful) novel The Professor. After several publishers had rejected it, Bront reworked the material and made it the basis of Villette. Most literary historians believe that the character of M. Paul Emanuel is closely based upon that of M. H ger. Furthermore, the character of Graham Bretton is widely acknowledged to have been modelled upon Bront 's publisher, George Murray Smith, who was her suitor at one time.